You are here: Home / Blog / Side Dishes / Look at Me…I Made Pasta…From Scratch! Look at Me…I Made Pasta…From Scratch! 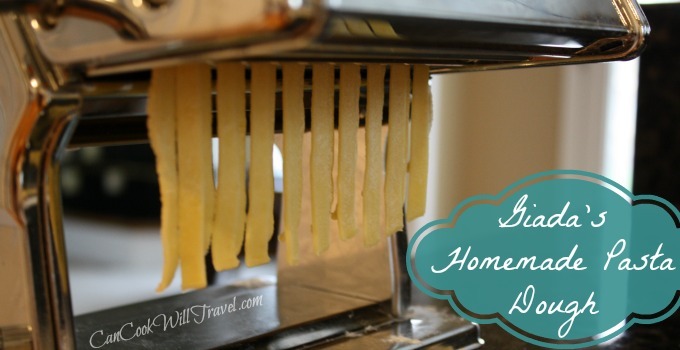 For this week’s culinary journey, I decided to dive into making homemade pasta. I have a fabulous cooking teacher in my mom, so I’ve helped her make pasta before, but I’ve never done it all by myself. I was really excited to try it solo. Mom gave me her pasta maker and I’ve never been brave enough to pull it out…until now. This blog is the perfect excuse for me to try stuff like this that I’ve never found a reason to make before. Let’s face it, it’s extremely easy and not that expensive to buy pasta (dried and stuffed) in the store, however, there is something so great about making it yourself and knowing exactly what ingredients were used and having control over that as well. So here I went, throwing caution to the wind (and a little flour on the floor in the process)! 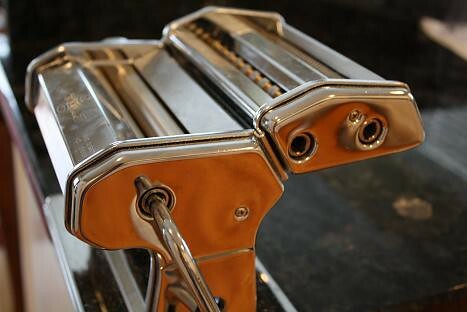 Here’s the amazing pasta press that attaches to the counter. I have to admit that I felt a bit like a fancy pants making pasta by hand. I was definitely wishing I was in Italy cooking alongside an Italian grandma who had been making pasta from scratch her whole life. 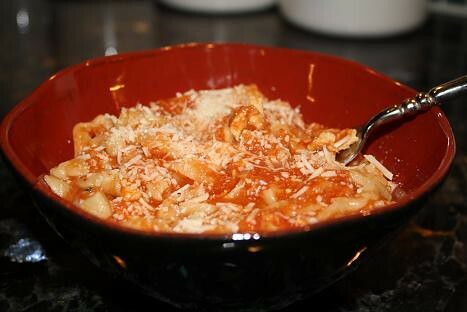 The pasta recipe I used was by the ever-so-reliable Giada de Laurentiis. 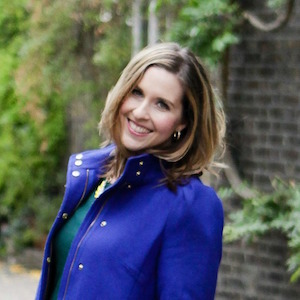 I mean, who better to go to for a homemade pasta recipe than Giada, I say! And the recipe was ridiculously easy to make using a food processor. I HIGHLY recommend it. Plus if you click here, you can watch this great video of Giada making the pasta dough recipe I’m featuring here, which is always useful to watch a recipe being made. To get the recipe and step by step instructions on how to make this pasta, click here. I decided to make two recipes this week with my homemade pasta dough. The first recipe involved using the dough and making it into a fettuccini. 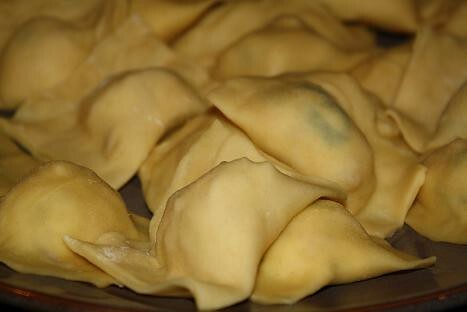 The second time around, I opted to make a stuffed pasta and went the route of ravioli. Now this recipe first caught my eye after watching Giada’s video that I linked to above. I saw the name of the dish on the right side of the website and thought that since I’d never made a ragu, this would be fun to make. I have to say the recipe was pretty tasty, had lean ground turkey in it (ie, healthy), and was not labor intensive at all. Plus this dish is a great way to sneak in some veggies if you have picky eaters in your home. 🙂 You’ll see what I mean when you check out the step by step instructions. If you’re looking for an easy pasta dish to make (with or without homemade pasta) this is definitely a good one to pick! Click here for the recipe, step by step instructions, and nutritional information. It’s very difficult for me to put into words how fabulous this dish was. 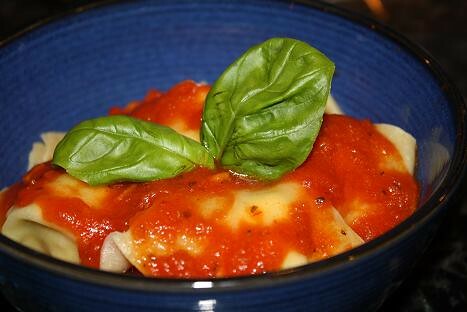 I made it Wednesday night, and while it was a bit labor intensive having never made ravioli from scratch before, the end result was beyond worth it. Please make this dish, but also note that I used another recipe by Giada. However, with her recipe, I used the dough I’d already made, so I didn’t follow her recipe exactly. I also almost made her sauce but I was really craving red sauce, so I just used my go-to spicy, jarred pasta sauce. The filling is so good and you get a little meat in there with some rotisserie chicken. I cannot say enough good things about rotisserie chicken. It’s convenient, efficient, and ridiculously flavorful (thanks Target)! (Sorry, I got side-tracked there.) Back to the filling…it has great flavor and can stand up against a nice, spicy marinara, which isn’t an easy task. I cannot emphasize enough how awesome this dish was…PLEASE make it. If you don’t make it because you want to, then make it because I want you to. This is definitely in my Top 5 favorites of dishes I’ve made so far on this site. Click here for step by step instructions and the recipe. Previous Post: « Splenda, er Splendid, Cookies!